Come for the pointy projectiles! Stay for the fabulous food! 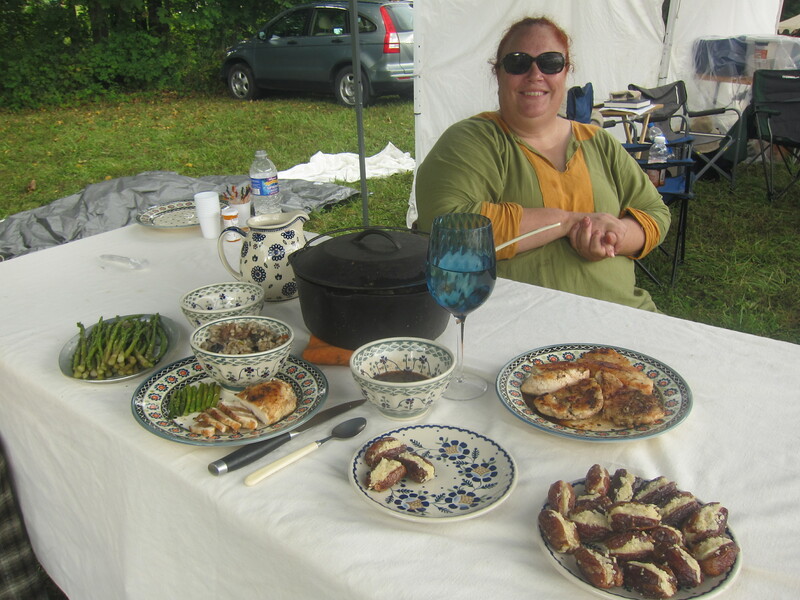 Accurately described by co-organizer THL Lijsbet de Keukere, Delftwood hosted its third annual Cast Iron Chef Cooking Tournament on September 3 as part of the barony’s archery event A Shoot in the Wildwood. The cooking trench at Cast Iron Chef cooking tourney III, with in the foreground the oven Algirdas scratch built. All photography by Elska. 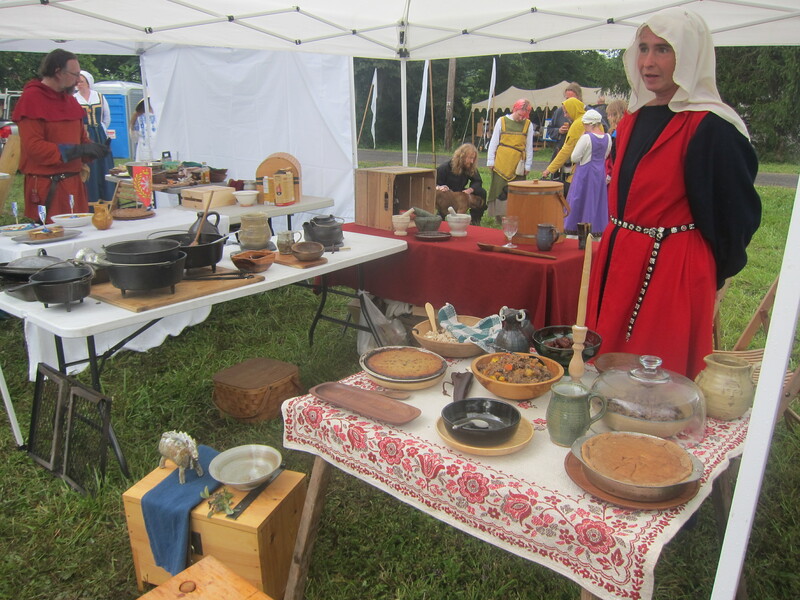 Each year brings a new challenge, and this year Lijsbet and Lord Sebastian Mora challenged the archers to shoot their best royal round on behalf of the cooks for first pick of their coveted Mystery Baskets. The baskets varied in theme, each one contained high-quality, valuable ingredients… and all had to be used in some way or another to create the best three-dish meal. 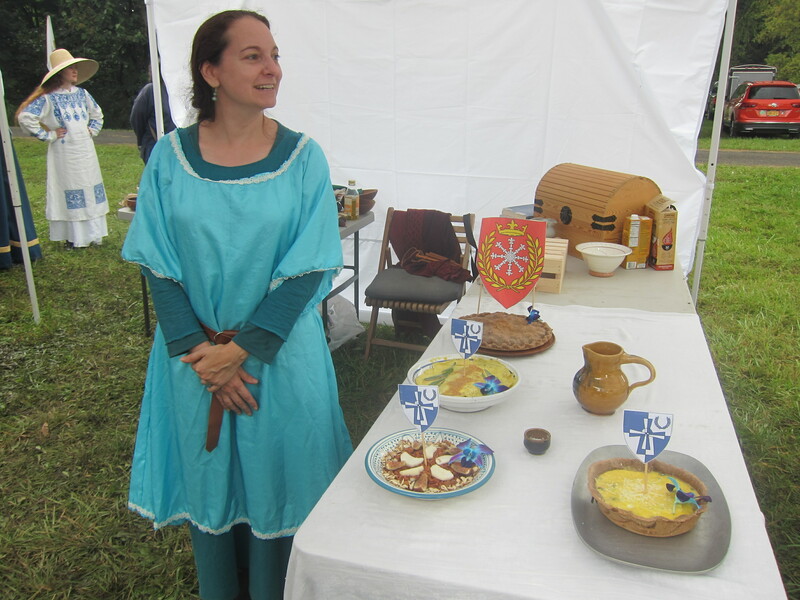 To supplement the Mystery Basket, the pantry had been bountifully stocked with pantry staples common for the average medieval household: beans, grains, common garden vegetables, simple dairy products, and foraged goods. While I tried my best to compile as complete a picture as possible, I was distracted by cooking, and the Book of Faces wasn’t as enlightening as hoped… my advanced apologies to anyone I might have missed! And without further ado, let’s introduce our cast iron teams! 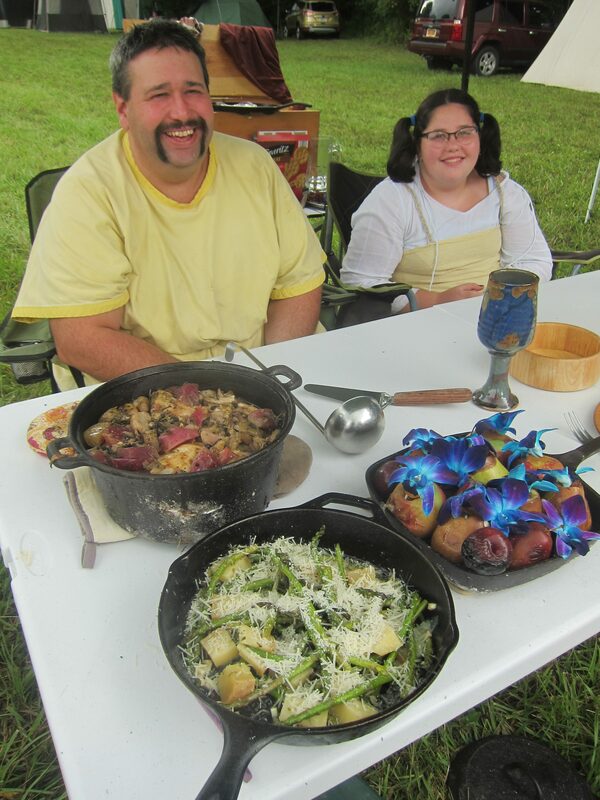 Kiera MacLeod had archer Edward Harbinger shoot her the East Kingdom Basket, which included barley, asparagus, rosewater, cherries, turnips, and rump roast. Ciaran & Wynn choose the Butcher’s Basket, which included an intriguing collection of pork necks, pork hocks, and chuck steak. Meadbh ni Clerigh, assisted by me, had her daughter Mary of Hartford shoot us the Sweet & Savory Basket; Mary shot the overall highest score. This basket included walnuts, dried figs, dried prunes, dried apricots, dried dates, and dried cherries with chuck steak. Matheus Hundamaðr, assisted by Katharine Thorne, had archer Snorri sketi Bjornsson shoot them the Perrote Basket. This basket included parsnips, lentils, chickpeas, turnips, chives, peach sauce, and pork shoulder. Thirteen-year-old Morgan Littlejohn, assisted by her father Fearghus macEoin Littlejohn, had archer Siobhan shoot them the Farmer’s Basket. This basket included gruyere, parmesan, turnips, leeks, celeriac, apples, pears, asparagus, and chicken. Algirdas Wolfus, assisted by Aldanza Wolfus, had archer Robert of Furness shoot them the Delftwood Basket. This basket included eggs, apples, olive oil, honey mustard, dates, and chicken. While the highest scoring archer gave her team first pick of the Mystery Baskets, the organizers then threw in a nice curve ball by reversing the order of who went shopping first in the Pantry! Did I overhear one cook thank his archer for having been a lousy shot…? What did we end up making? Grikkland Grautr: a pottage of red lentils, rice, chickpea, parsnips, onion, garlic, butter, cumin, and celery seed, garnished with shaved radish and chives. Pork in the way of Serkland: pork, rubbed with rosemary infused olive oil, crushed long pepper, salt, coriander, cumin, and turmeric, seared then stewed with verjuice and dried figs, finished with fresh figs. Sœtrbröd: whole wheat and ground walnut pancake, spiced with mace, nutmeg, and ginger, topped with peach preserves, butter, cooked apricots, and roasted walnuts. Stuffed roasted apples and pears, decorated with edible flowers. Vegetable and cheese egg tart. Apple and carrot salad (garnished with fig and almonds). Chicken bruet with mustard sauce in a leaf of egg. Kidney and Steak stew with dates and apricots. Barley with raisins and shaved almonds. Bread pudding with dates and figs. Sage water for hand washing. 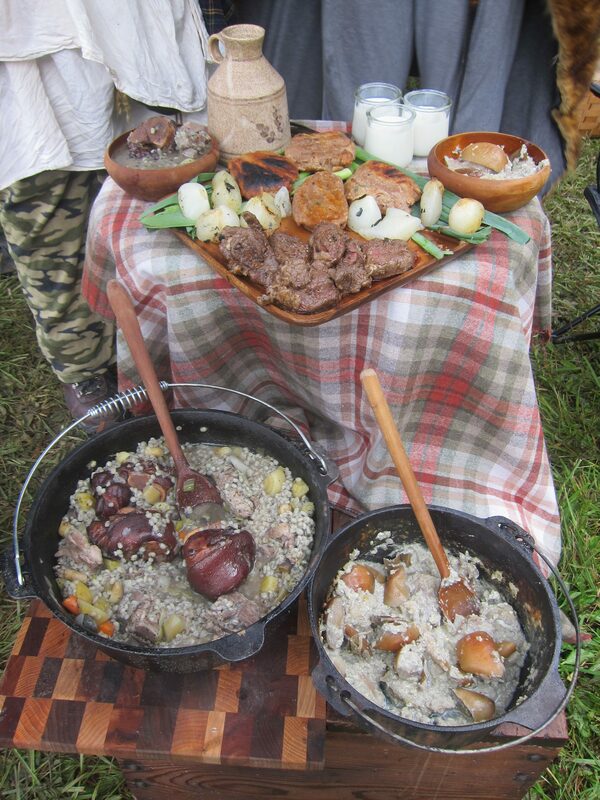 Pig knuckle and barley pottage. The winners of the third Cast Iron Chef cooking competition, with the competition organizers. 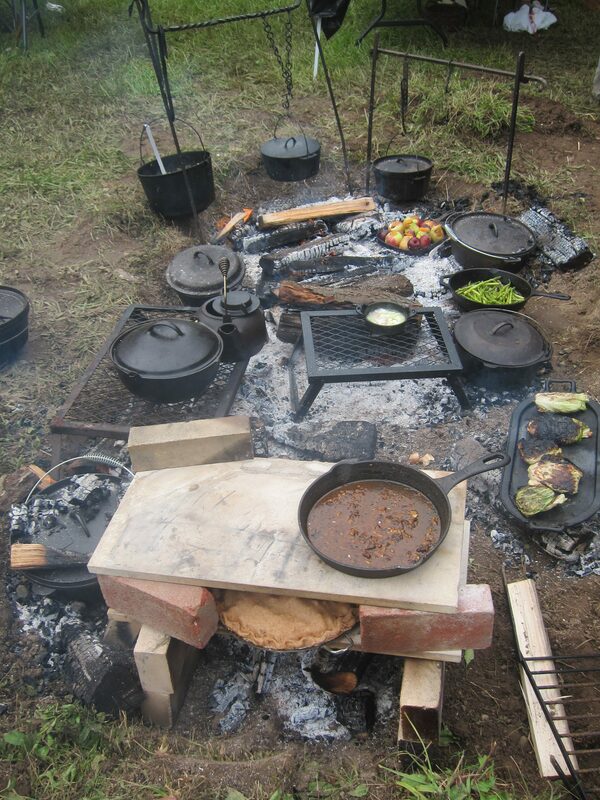 For me, this was the first time cooking multiple dishes over open fire, and am I glad I brought all my cast iron pots & pans, we used every single one! It was a wonderful experience, not competitive at all. There was many a time where someone exclaimed for some sugar/cinnamon/flour and it would instantly appear from another cook’s station. 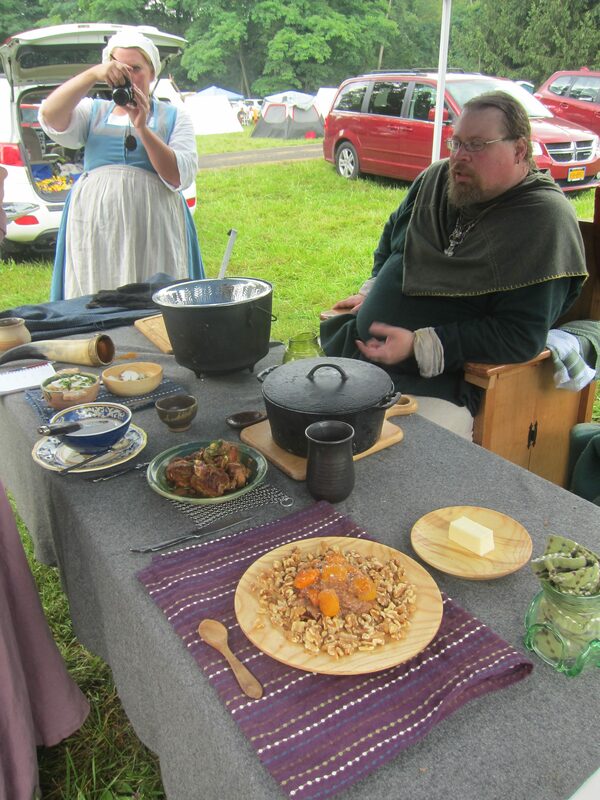 We loaned out gear as needed and kept and eye on all that was cooking. I do not think I would have done anything different, and hope to be able to participate again next year! Thank you, Lijsbet and Sebastian for organizing, again, this wonderful event. A big thank you to all the volunteers and donors of wonderful foodstuffs, thanks to you the pantry was glorious! Thank you to our judges for your constructive help and feedback. It made for a most wonderful outdoor experience. All in all, I hardly even noticed the rain. While being able to make something wonderful out of pig’s knuckles and hocks is a worthy deed indeed, the Baroness felt she was most impressed by 13-year-old Morgan and her third time entering this competition successfully, thereby Morgan and her dad Fearghus were the Baroness’s pick. 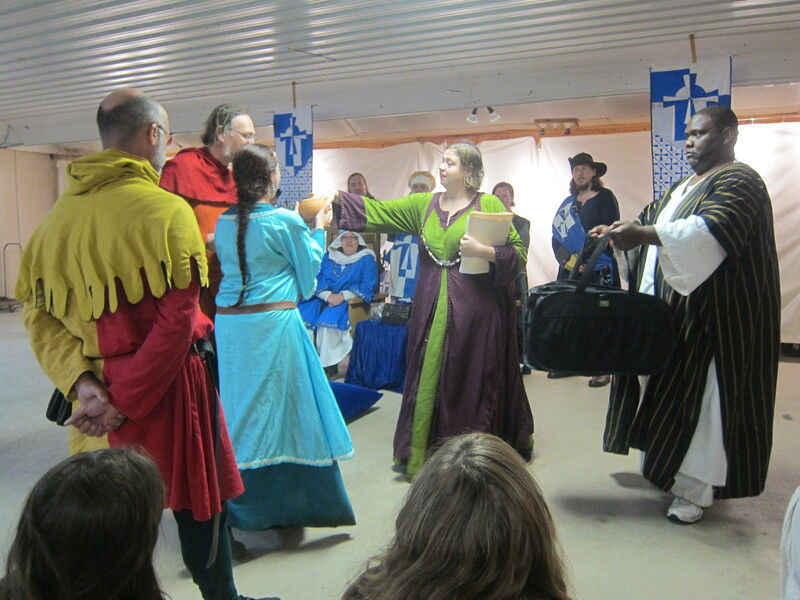 Playing to the crowd by bringing Delftwood and Kingdom regalia – and choosing the Delftwood Basket – the Baron was not able to overcome all this Delftwood splendor and picked team Algirdas & Aldanza Wolfus as the Baron’s choice. But don’t think that was all! Algirdas built a completely functional on-site oven as well, and the two of them walked away victorious as the Ultimate Cast Iron Chefs! Vivat! For many more pictures of the A.S.52 Cast Iron Chef, see John Michael Thorpe’s photos here and JJ Art and Photography’s here. For more information about this awesome Tournament, see here.